Leading business development, Erica focuses on the value that Comfy can deliver across the buildings industry. Her expanding team helps drive the company’s growth targets through partnerships, like CBRE and Intel, and designs go-to-market strategies for new opportunities. 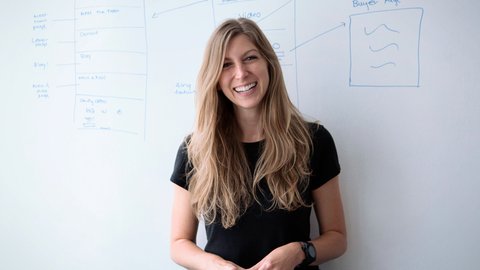 Erica also works across the organization to help define the future product roadmap and long-term strategic positioning. Little-known fact: Erica is one of our resident closet nerds with both mental and physical prowess. In college, she was both secretary of the math club and captain of the dance team. Tell me about the path that led you to join the Comfy team. Before joining Comfy, I spent a little over 8 years at Johnson Controls working on their Strategy and Corporate Development team. I started there as an intern while completing my undergrad degree in Applied Mathematical Economics—I know, that’s a mouthful. I was lucky to have the opportunity to bounce around between a variety of roles in different departments: finance, strategy, and a lot of M&A. In my last few years, leading the Open Innovation team, I was tasked with finding new, cutting edge technologies JCI could sell to clients or implement into their own product development. So when I came across Comfy, I thought, “man, this is really cool!” For one, I loved—and still love—the team and thought the company was taking a really interesting and totally different approach to the market. Instead of talking exclusively about energy and building managers—as important as those things are—they were the first to really focus on the people. I like to say my time at JCI made me just dangerous enough to jump into the startup world, especially at a place like Comfy, because I had developed a good understanding of how buildings operate, what building owners care about, and what technologies are emerging in the space. Working with Open Innovation was especially useful because I had a chance to learn a lot about how startups function, how fundraising works, how teams develop, etc. That’s really important in my current role, because it requires looking across partnership opportunities, locating new markets, and then of course, evaluating how our product roadmap should evolve. The most important things for me to figure out are what pain points our buyers have and how Comfy can help solve those and deliver value, all the while creating awesome occupant experiences. Where do you think building technology is headed? It's really interesting because historically, we’ve seen building systems that have been up and running for decades with virtually no major upgrades. In fact, I was just on a call yesterday with an owner of a really prominent building in one of the top three cities in the country and he was explaining how they are just now upgrading from pneumatic thermostats. For the non-building experts out there, that’s HVAC technology, which has been around for over 100 years! I’m constantly reminded that while we sit in the middle of an area [Silicon Valley] that is all about cutting edge technology, most of the world is still working within the confines of these legacy systems. So I think we’re going to start seeing more technology, like Comfy, that can be easily adapted to existing buildings, because most of them are going to be around for quite awhile. Oftentimes, people put a lot of attention on brand new construction projects...you know, sleek architecture and glistening new buildings. While those projects are amazing to prove what’s possible, I get really excited about proving what’s likely. One of my favorite things about Comfy is that we’re pure software, we simply leverage what’s already there. That, I think, is something I’m excited to see more of with building technology, the ability to drive a huge amount of value from existing infrastructure. "So yeah, that’s pretty nerdy I guess, but who doesn’t love a good beef bourguignon?" What could you geek out on for hours? Cookbooks. It’s almost a bit weird, I’m slightly obsessed. I actually rent them from the library—I know, very old school—and have renewed the one I’m reading now 3 times. I probably spend more time reading the books than actually cooking...they're so entertaining! There’s a lot more humor involved with cooking than you would think. Recently I’ve been trying different recipes using spices that I brought back from a trip to Morocco, which is really fun. So yeah, that’s pretty nerdy I guess, but who doesn’t love a good beef bourguignon? Exactly, got a great recipe for that...from a cookbook. What 3 things would you bring if you were stranded on a desert island? Oh gosh….I don’t know, would I bring [my fiance] Woody? Kidding, of course...I would need someone to play Heads Up with me! I love that game, and it keeps you sharp. So I suppose I could bring an iPad with the Heads Up app installed and Skype to chat with my family and friends. Oh and obviously, I would have to bring some cooking supplies! That includes wine, right? Booze would be great...if not slightly dehydrating on a desert island. To be honest, I’m a pretty open book, but I guess a “fun fact” is that I’ve biked through three national parks: The Grand Canyon, Bryce Canyon, and Zion National Park. Biking is my jam...I’m by no means a pro—or even a regular—but I have seen some pretty epic things on two wheels. I’ve actually biked across Iowa and Ireland too...okay now I’m just trying to make this sound cooler, but it was awesome! Want to work with Erica? Well, we're hiring! Check out all open positions and apply here.